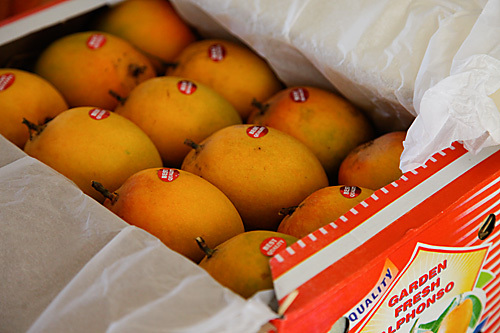 I love alphonso mango so much that I find it very difficult to cook with it. And on the rare occasion that I do, it has to be something truly spectacular. Or something that would bring out the flavours of the mango, a no mean feat if you ask me, or make it the centre of attraction, the jewel in the crown as in this case where it adorns a simple and fulfilling dessert. This pudding is so simple to make. And its quick too. It can be eaten at any temperature so you dont have to wait until it chills in the fridge. But it tastes best when chilled so if you have the time then go ahead and chill it. Its great for babies and toddlers too. You can serve them this pudding without fruits or pureed and mashed fruits of your choice. In this pudding too, I have used the vanilla bean. I adore the tiny black specks of the ground vanilla pod that lend both beauty and flavour in abundance. If you dont have some on hand you could substitute with vanilla extract, but such ingredients as the vanilla bean not only enhance the taste but also lend an exotic natural touch. It is worth the effort and the expense. Mangoes and pistachios pair well. A sprinkling of chopped pistachios over the mangoes here adds crunch, colour and grace. 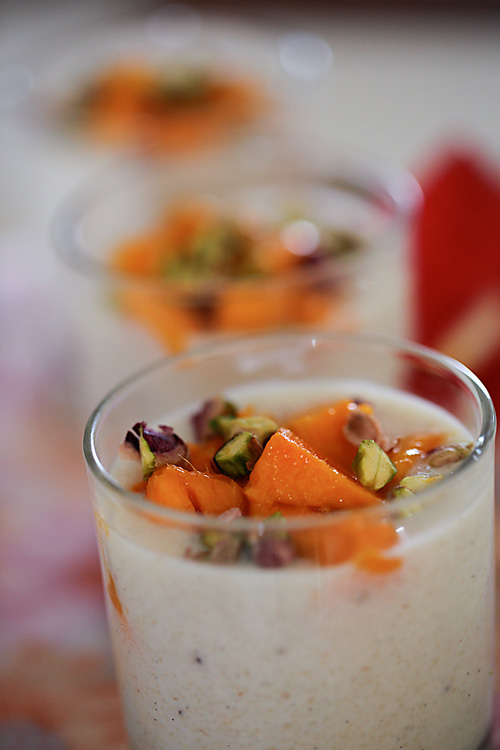 The simplicity of this pudding is enhanced by the king of fruits, the alphonso mango! You could use any other seasonal fruits like strawberries or any other berry. A citrus pairing with cleaned and segmented ripe orange will work well too. With the help of a pair of scissors chop the vanilla pod, if using into tiny pieces. In a blender or food processor, grind the sugar and vanilla until fine. You can sieve the vanilla sugar if you do not want the tiny black specks to be seen in the pudding. In a medium sized wok or saucepan, heat the ghee or butter over a medium flame. Lower the flame and put in the semolina and stir until roasted and golden, about 3 to 4 minutes. Pour in the milk, raise the heat to medium and bring to a boil. Stir in the sugar and mix well. Cook for a couple of minutes more and and turn off the heat. Pour the pudding into serving bowls or transparent glasses. Place a few cubes of chopped mango over the pudding. Sprinkle with the chopped pistachios. Serve at room temperature or cold. Tastes best when chilled. I'd do anything for mangoes now. Anything. Really. Sigh. Gorgeous pairing in a pud! Semolina, mango and pistachio… WOW! I love it! Beautifully photographed as well A!! Looks divine…lovely neat colorful clicks! hey anu, thanks for stopping by.and, MY WHAT A LOVELY SPACE YOU HAVE!! beautiful clicks. 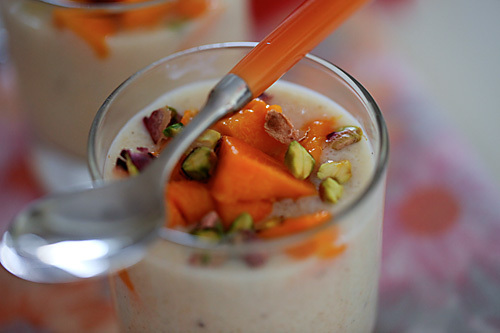 pistachios and mangoes on simple semolina kheer is such a good idea! 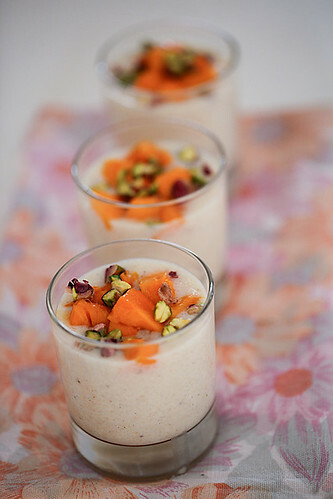 Semolina Pudding is new to me… but 'Mangoes'… they are a total fav n win hands down over any other fruits…. HOW DO U GET THESE IDEAS ? 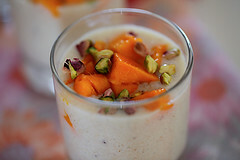 Such soothing n beautiful clicks.Love the one other kheer/pudding you have made with orange. Am curious where do you source vanilla bean in India? Shilpa: I'm a big fan of vanilla beans. I source the bourbon and tahitian vanilla beans from abroad and find that good quality Indian vanilla beans are great too. Kerala is a good place to look for them. Eco Agri is another great source for good quality organic vanilla beans. Am a big fan of your recipes and photos.Not a single day goes without looking at ur recipes/photos.Your photos are really a feast for eyes..
A small and humble suggestion though…when I look at some of the pictures very very closely, few drops/bits of food lie on the dish which hold the food. eg 1)In the first picture above (3 bowls of pudding),the first bowl has a small drop of spilt pudding at the bottom. 3)Eggless Chocolate Cream Cupcakes with Ferrero Rocher Nutella Icing — in the picture where cupcakes sit on the grill few drops of frosting is spilt on the counter top. Love those mangoes on the pudding….ummm…looks so yummy..
Too bad I can't get those lovely Indian Alphonso mangoes here..
Atleast I could drool at your pictures! psst: Love the third picture from the top..